We all know the health benefits of eating more fruits and vegetables. Yet there seems to be no shortage of days that go by where it seems darn near impossible to eat the suggested 5+ servings a day. So just how can we do it? Well, it’s easier than you think! Here are 5 simple ways to eat more fruits and vegetables each day! 1. Eat ’em at Breakfast: Start your day with a piece of fruit at breakfast. Add some berries to your oatmeal (like in this delicious parfait), top your toast with a sliced banana, make a smoothie that includes fruit or simply have fruit mixed in with your yogurt. Whichever way you choose, you won’t regret adding this great tasting source of vitamins, minerals and fiber to your morning! 2. Buy ’em Frozen: Does it seem your fruits and vegetables spoil before you get a chance to eat them? Then buy them frozen. In fact, these frozen fruits and vegetables often have more beneficial nutrients than their produce aisle counterparts. Why? Because they were frozen shortly after being harvested fully ripened and at their nutritional peak. 3. Drink ’em: Remember the green drink I shared last month? This drink includes 4 servings of fruits and vegetables in one portable, tasty smoothie. 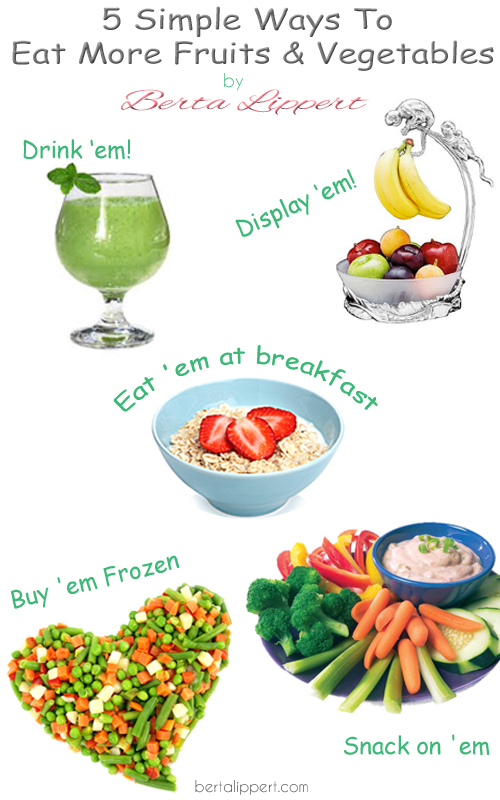 There are countless yummy, healthy, drink recipes to be found online to make eating more fruits and vegetables a snap! 4. Display ’em: Make your fruit and vegetables front and center when you open the fridge so they’ll be the first thing you see when you’re looking for a treat. Additionally, keep a bowl on the counter to encourage you to eat more. If you keep it where you can see it, you’re more likely to eat it! 5. Snack on ’em: Some of my favorite snacks include veggies and hummus, kale chips and my old stand-by, an apple with peanut butter. Replace your not so healthy snack with fruits and vegetables. Not only will they help you long after your co-workers sugar high has worn off, but they taste great too! These are 5 easy things you can do today to start eating more fruits and vegetables. For more information on why fruits and vegetables are so beneficial to our health, check out this great article from The Harvard School of Public Health to learn more. You can also watch my segment on Good Morning Northland where I share these 5 strategies live on air as well as a yummy recipe! 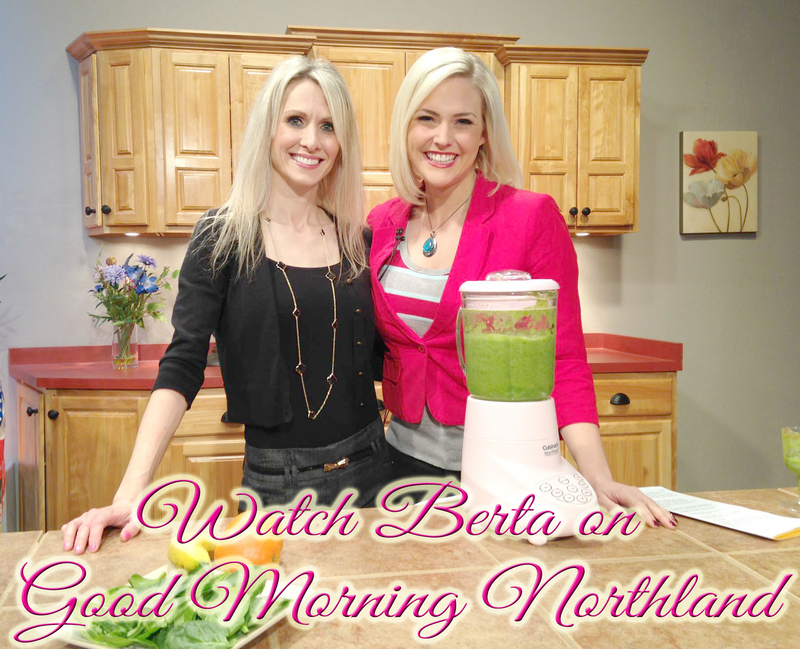 Click Here to see my segment on ABC’s Good Morning Northland – WDIO! Place ingredients in food processor and blend until smooth. Add water if needed to achieve desired consistency.